Andover Ventures (TSX-V: AOX and OTC Other: AOVTF) released the fact that it has completed SEDAR Filing of the National Instrument 43-101 technical report Resource Estimate for their Burgin Extension Deposit in the East Tintic Mining district of Central Utah. The project area is owned by Chief Consolidated Mining Company (owned approximately 78.5% owned by Andover). The technical report is available at www.sedar.com and also on the corporate web site, www.andoverventures.com. Andover Ventures (OTC Other: AOVTF; TSX-V: AXI) has assayed the first two holes from the Company’s 2011 drill program on the Sun Property in Alaska. Drill holes Sun11-23A and Sun11-24 were completed in June 2011 at depths of 316.4 and 157.3 meters, respectively. Significantly, drill hole Sun 11-24 returned 16.5 meters of 1.6% copper, 3.49% lead, 10.25 zinc, 86.6 g/t silver, and 0.24 g/t gold (6.6% copper equivalent). These first two holes represent a good start to the results portion of the Company’s 2011 drill program, and additional assays should be forthcoming and will be met with great expectations. Andover Ventures (OTC Other: AOVTF; TSX-V: AOX) has completed its 2011 drill program at the Sun Property in Alaska, including 7 drill holes totaling approximately 1,514 meters. The focus of the 2011 drill program was to test the down dip extension of the Main Sun Deposit, to verify historical drilling and to fill in gaps in the previous drill patterns on the Main Sun Deposit and to test the S.W. Sun area with three exploration drill holes. The 2011 drill core has been split and sent to ALS Minerals located in Vancouver, British Columbia, Canada, for assays. Results will be released when they are received. Our very own “Ranting Andy” was privileged to tour Andover Ventures’ (OTC Other: AOVTF; TSX-V: AOX) Tintic district property, just 70 miles South of Salt Lake City, Utah. 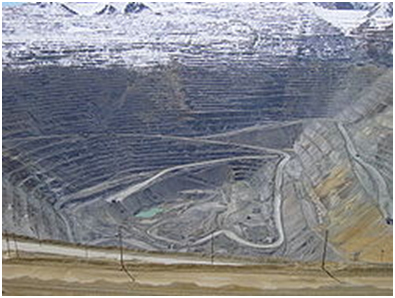 Many seasoned investors do not realize Utah is one of the most prolific mining states in America, home to the continent’s largest open pit mine (Bingham Canyon, photo below) and a rich mining history dating back to the 1800s. Andover’s dynamic CEO,Gordon Blankstein, an international businessman with a history of successful acquisitions and divestitures, acquired the Tintic District in 2008, essentially out of bankruptcy. His specialty is buying assets cheaply, thriftily improving their value, and selling them at higher prices. In this case, I believe the ultimate sale price could be many multiples above the $24 million paid to acquire the Company’s vast asset base. The 16,000 acre property, controlled via 78% ownership of Chief Consolidated Mining Company, represents the third largest land holding in all of Utah, and last saw production in 2002 via its Trixie gold and silver mine. Trixie and its sister mine, Burgin, were two of 23 former underground mines in this world class district, which has cumulatively produced 2.3 million ounces of gold, 250 million ounces of silver, 250 million pounds of copper, 350 million pounds of zinc, and 2.2 billion pounds of lead over the last century, all from ore bodies above the water table due to a lack of mine technology that has since been developed. Andover Ventures (OTC Other: AOVTF: TSX-V: AOX) announced today that Kennecott Exploration Company (“Kennecott”), a division of Rio Tinto plc, has notified Chief Consolidated Mining Company (“Chief”) (78.5% controlled by Andover) that it has completed a Cultural Resource Survey around the proposed drill targets planned for 2011 and has received their drill permits from the Department of Oil, Gas and Mining (“DOGM”) for the State of Utah. Andover Ventures (OTC Other: ADEXF; TSX-V: AOX) completed an initial resource estimate at the Burgin Extension Deposit, a high grade silver-lead-zinc property. In reviewing the resource estimate below, keep in mind it only includes the Burgin Extension and not any of the other known deposits such as Zone A, 5340 Zone, Zone B, and the Ball Park Zone. According to our estimates, using $36.68 for silver, $1,553 for gold, $1 for lead, and $1 for zinc, we calculate a combined indicated and inferred resource of 41.1 million silver equivalent ounces. Significantly, according to GoldMinerPulse (www.goldminerpulse.com), the average market cap per ounce of silver equivalent was $2.21 as of June 21, 2011. At $2.21 per silver equivalent ounce, this implies a market cap for Andover of $90.8 million compared to its current market cap of $50.2 million, an increase of $40.6 million or 81%. And remember, this resource is for the Burgin Extension zone, not for any of the other zones or for the Company’s SUN property in Alaska. Andover Ventures (OTC Other: ADEXF; TSX-V: AOX) has begun to mobilize for its 2011 drill program at the SUN volcanogenic massive sulfide (“VMS”) deposit in Alaska’s Ambler Mining District. The Company’s 100% owned SUN, silver-copper-lead-zinc-gold VMS prospect is located on approximately 17,980 acres of land in the eastern Ambler Mining District in Northwest Alaska. The Ambler District, as recognized by Metals Economics Group, is one of the world’s largest undeveloped copper-zinc districts. The SUN deposit is generally accepted to be the second largest known deposit within the district – the largest is NovaGold’s Arctic deposit in the central part of the district and the smallest in size is Teck Resources’ Smucker deposit at the western end of the belt. You are currently browsing the archives for the Andover Ventures category.